DeAngelo Tyson is not a man of many words. In fact, his quiet demeanor is what is most often talked about. However, DeAngelo has a big heart. That big heart is what led him to start the Tyson Foundation. Originally from Statesboro, Georgia, ‘De’, as he is affectionately known to his family and friends, has overcome challenges throughout this life. Abandoned by his birth parents, De spent the majority of his young life at Joseph’s Home for Boys, a long-term group home in Statesboro that provides a stable living environment for troubled or deserted kids. He became the first child to go from that home straight to college, his football talent earning him a scholarship to the University of Georgia. 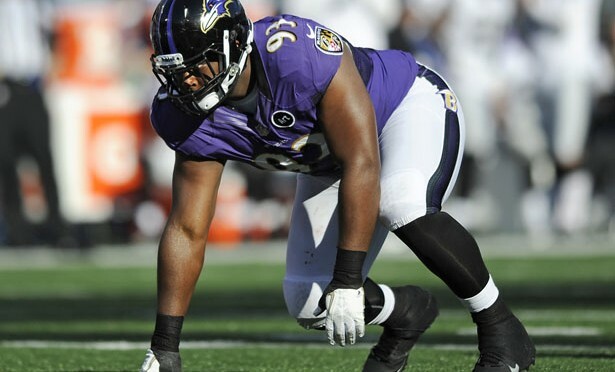 The Baltimore Ravensselected him in the seventh round of the 2012 draft. Throughout his life, DeAngelo has been strengthened by lessons on love, trust and forgiveness. He’s come to terms with how his life as unfolded, embraced a new family (the Lambs’) and married to his high school sweetheart, Shabrae, with whom he has three kids. Being blessed with the ability to give back to the town that gave him so much, DeAngelo founded the Tyson Foundation in 2014. Through the foundation, he wants serve youth, young athletes and teenage mothers through support and opportunities that will empower them to unlock their own personal potential. DeAngelo wants to give hope to children who are growing up like he did – he wants them to know that they can rise up and be successful. Along with his wife Shabrae, who was a teenage mother herself, he hopes to also be able to serve teenage mothers, giving them the support and resources they need. Currently playing in his third season for the Baltimore Ravens, De and his family are current resides of Baltimore. Distance, though, is not an issue for DeAngelo when it comes to helping others. Along with his foundation board, DeAngelo is excited to be able to give back to those who helped him achieve the success he sees today. To find out more about the Tyson Foundation, please visit www.thetysonfoundation.org or contact Mandy Edwards at mandy@memarketingservices.com.